Microsoft on Wednesday set out to boost workplace collaboration with a giant Surface Hub touch screen tailored for brainstorming. The touch-screen Surface Hub monitors powered by coming generation Windows 10 software were pitched as affordable tools to make conference room meetings intuitive and productive in an era when at least a few participants are taking part virtually. 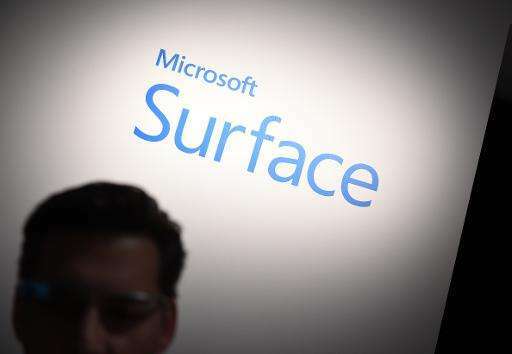 "Look at the way three or four teenagers get together in an Xbox game, share content and upload video easily in just minutes," Brian Eskridge of Microsoft's devices business told AFP while providing an early look at Hub. "That is what we are doing with Surface Hub, getting people around information to get things done." Hub, which Microsoft teased at a media event early this year, will be available for order in July in 24 markets around the world and begin shipping two months later. It will be available in a 55-inch model priced at $7,000 and an 85-inch model priced at $20,000. "We are talking about a pretty sophisticated tool that is more appealing than traditional white board, projector or video conferencing tools," Forrester analyst Frank Gillett said of Hub. "It is like someone inventing a large-screen iPad for collaboration; it is hard to appreciate until you try it." Gillett predicted Hub will be particularly appealing to executives and those whose jobs involve creativity. He also deemed the Hub price to be competitive in businesses where tele-presence set-ups can cost in the hundreds of thousands of dollars. "This has advantages of half-million-dollar tele-presence rooms at much lower cost, and you can even wheel hub around open space offices." Hub features include an ultra high-definition display, simple touch controls, built-in cameras and microphones, and Microsoft productivity software such as OneNote and Skype for Business. Motion tracking technology used in a Kinect accessory for Xbox consoles was built into Hub cameras, according to Eskridge. Hub will also work with other video conferencing services, such as Google Hangouts. Microsoft has been testing Hub with companies, including a law firm with a vision of one day using the device to present evidence in courts, Eskridge said. Market research indicates there are some 50 million conference room type spaces in businesses around the world, and another 17 million executive offices where employees gather for meetings, according to Microsoft. The US technology titan said trends show work meetings are increasingly frequent, impromptu and quick, requiring input from employees located elsewhere.